Where we offer dedicated support for a pension provider, this means that Brightpay can produce the contributions files (and where applicable the enrolment files) in the correct format for the pension provider in question. 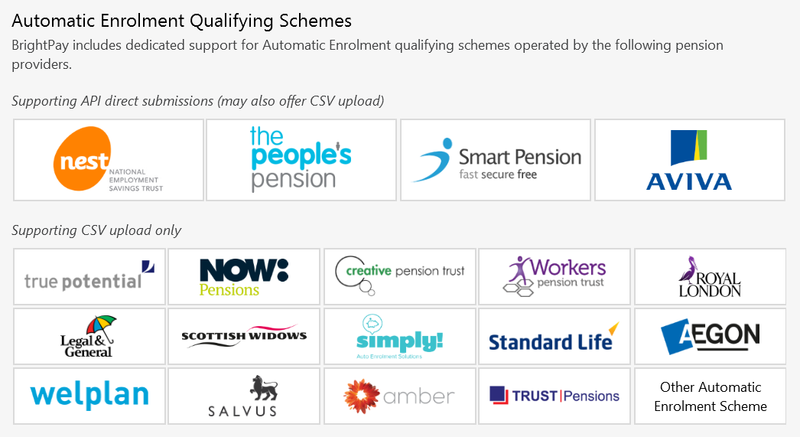 Some pension providers have enabled direct integration with BrightPay. This is known as API integration and means that the relevant pension files can be submitted directly from BrightPay into the pension provider's portal, similar to how RTI submissions are sent to HMRC. API integration means that users no longer need to export and save their pension files in CSV format and then log into the pension provider's online portal to upload their pension data. Currently API options are available for NEST, Smart Pension, The People's Pension & Aviva. Please note: when preparing enrolment files/ contribution files in BrightPay, care should be taken that details entered at each step match exactly the details given to you by your chosen provider (including upper and lower casing). This is to ensure that enrolment files and contribution files will upload successfully for you. Where a pension provider that BrightPay currently offers dedicated support for does not offer an API option, then the pension files required by the pension provider can instead be saved in CSV file format and subsequently uploaded into the pension provider's online portal by the user. At the prompt, click Save File. Save the file to a location of your choice, ready for upload into your pension provider's portal. At the prompt, click Save File. Save the file to a location of your choice, ready for upload into your pension providers portal.